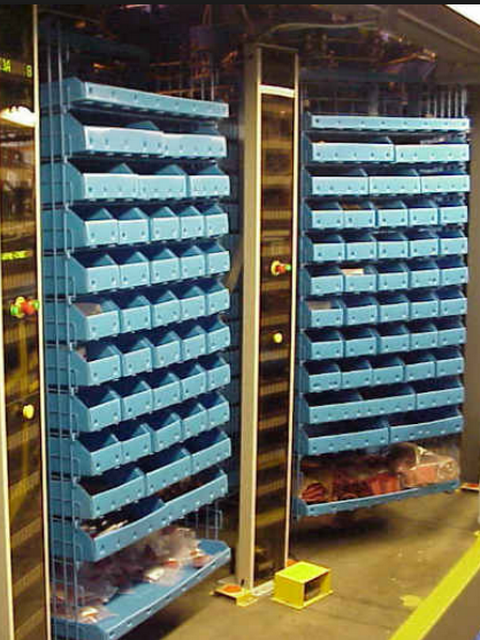 Carousels - Warehouse and Distribution - Automatic Systems, Inc.
Horizontal and Vertical carousels are part of a Goods-to-Person approach to automation and increase storage density, throughput, and efficiency. They can be manually operated for simple transactions or via software and computer controls allowing a WES/WMS to control the inventory fully. They can efficiently deliver product to the operator and are generally used in small parts storage. Horizontal Carousels are manufactured by a number of companies and come in many widths and heights. They can be stacked on top of each other to create one picking zone on the first floor and a second zone on a mezzanine level. The bin width and heights used in a carousel are variable, and you can adjust location height in a horizontal carousel at any time by rearranging shelves. One way to implement horizontal carousels is in groups or “pods” for to increase picking times. A pod is two or more horizontal carousels used in an integrated workstation with software and pick to light technology. While an operator is picking from one carousel the other carousels are pre-positioning the next pick, so the operator is not waiting between picks. Utilizing a carousel in this way ensures there is always a bin waiting for the operator to pick. Batch picking is also frequently done when using horizontal carousel in pods and allows an operator to fill multiple orders at one time. Using inventory management software, an operator can create a batch of orders and fill them all at one time. When the horizontal carousel presents an SKU for picking to the operator, the operator selects the total SKU quantity for all orders. The operator can then fill all of those orders at that location or pass the batch downstream for consolidation. Using batch picking, the operator only visits an SKU location one time minimizing seek times on the carousel. When combined with pick-to-light technology; the operator is directed to the correct location of each pick to increase accuracy further. A light bar is integrated with the pick face of the carousel and lights direct the operator to the location displaying the needed quantity. 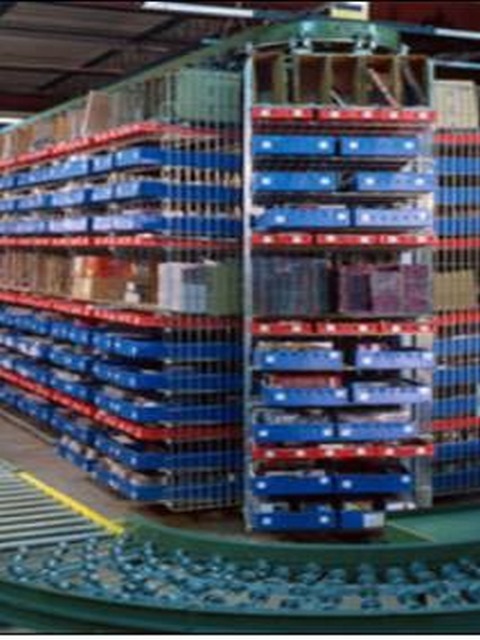 Vertical Carousels and VLM’s are also manufactured in many different weight, height and shelving layout configurations. Vertical Carousels are built with a series of carriers attached to a chain drive at fixed locations. The carriers move in a track around a vertical loop that can go in both forward and reverse directions depending on which direction will get the next tray to the operator quickest. Vertical Lift Modules (VLM’s) consist of two columns of trays. There is a mechanical inserter/extractor that travels up/down between the different levels of stored trays in the columns (like an elevator) and automatically locates then retrieves the trays as needed from both columns. ASI uses these technologies in a variety of ways as standalone units (for WIP for example) as well as in integrated solutions with many other technologies.